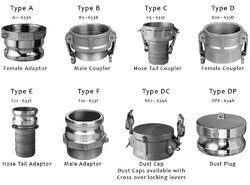 Leading Wholesale Trader of coupler female and camlock hose coupling from Ahmedabad. With a focus on the ever-evolving demands of our customers, we manufacture a wide range of Female Brass Quick Release Coupler. Thread Size 1/2" To 6"
Camlock Coupling offered comes in quality construction finish and can be made available in different configuration choices as per the specific demands of the customers. As leading names in the field of Camlock Couplings, we ensure these provide for quick, tight leak proof connection support to pipes and hoses. Some of its features include eliminate the need of making threaded/flanged connections; choice of different finish sizes from ½” to 12”; suitable for handling of liquids, vapors, gases and dry products.